A garden favourite all year round but especially in the cold winter months. Or some seeds to peck at. Whilst Christmas is a time for turkeys, calling birds and partridges, it’s the charismatic robin that will be the likely star of most festive cards. Its bright eyes, friendly disposition and scarlet chest have long been the emblem of a British Christmas. Young robins begin life inside white or pale blue eggs with reddish spots, tucked into carefully furnished nests of dead leaves, wool, moss, grass or hair. After being incubated by their mothers, the young hatch after around 15 days and are then fed by both parents. Fledging occurs after a further 12 or so days. Juvenile birds are speckled brown all over, and lack the red breast to avoid being seen as threatening by adult birds (In fact the breast colouration is purely for territorial warnings, and not used for courtship, as both male and females have the same colouring. 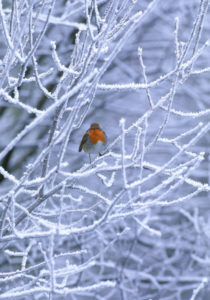 Red triggers aggressive behaviour in males, and robins have been known to attack fake birds or tufts of red feathers.) Robins are very attentive parents, and are kept busy from late March onwards, rearing up to three broods of young. No wonder some of them look a tad bedraggled come August! Both male and female birds look alike, and are common inhabitants of parks and woodlands. Often regarded as the gardener’s friend, I know numerous people who have ‘their own robin’ who visits whenever the soil is being turned, in search of worms and insects. As the robin is one of the few birds who keeps to the same territory year-round, it is probably safe to assume that it’s the same one who keeps coming back during a season (although we do receive an influx of Scandinavian birds over winter, so you can never be too sure.) Their diet also comprises seeds and fruits, and I’m certain they’d be grateful for a few bird feeders, mealworms or fat balls left out this winter, as on severe nights a robin can lose up to 10% of its body weight. Being such small birds (around 14cm in length), robins are often short-lived. The average life-span is two years, although the oldest recorded wild bird lived to eleven years and five months. Cat owners would be wise to keep their moggies in at night, and give them collars with bells, as the domestic cat kills fifteen times more robins than are eaten by owls or sparrowhawks. Over the festive period, a robin’s mind turns to finding someone to snuggle up with in front of the fire, and pairs are formed between December and March. To attract a female, the males impress with song from high perches, although it is actually the female who does the initial chasing. Once he is won over, the male seeks to cement the bond by bringing her lovely treats, like worms and insects. Who said romance was dead? Perhaps it was these loving gestures that led to robins decorating Valentine’s cards long before they made it onto a Christmas one. The folklore associated with robins (as with many animals) is a mixed bag. On the one hand, a romantic and festive friend, on the other an emblem of death (thought to be the result of them loitering in graveyards, waiting for the earth to be upturned. More an indication of a love of grubs, than of a morbid streak.) There was for a time a belief that robins would cover dead bodies over with leaves, as in the story Babes in the Wood. 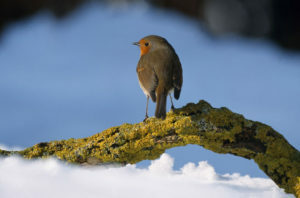 More generous references to robins include the noble bird who plucked thorns from Jesus’ forehead, Shakespeare’s Ruddock with it ‘charitable bill’ in Cymbeline (Ruddock being the old English for robin) and Wordworth’s question, “Aren’t thou the bird who Man loves best/The pious bird with the scarlet breast”. It is also said that a robin’s perch positioning can be used to forecast the weather – the top of a bush heralding warm weather, whilst being tucked into the branches meant rain. The redbreast sacred to the household gods,? Wisely regardful of the embroiling sky? In joyless fields and thorny thickets leaves? His shivering mates, and pays to trusted man? His annual visit. Half afraid, he first? Against the window beats; then brisk alights? On the warm hearth; then, hopping o’er the floor,? Eyes all the smiling family askance,? And pecks, and starts, and wonders where he is-? Till, more familiar grown, the table crumbs?